New "project" in front of the garage. After years of trying to convince a old man to sell one of his VW cabriolets. Then i will try to an original restoration, lets see if i can keep from adding more HP,better gearbox, disc brakes. Her is the finding place. The car was scrapped in the early seventies, and was picked up by the latest owner from a scrap yard. Then the car spent some years in a small shed. But when the shed almost fell over the car it was dragged outside. And there it has spent the last five years. The top wasn't perfect to start with, and it has not become better in the outside. Here is Åeke the last owner checking out the rescue work, when we had to drag the object up on the road, with left front wheel completely frozen. A quick check under the front hood did not bring out any big surprises. Except for this tag. After some cleaning up i could read a name and Stockholm. I checked the name in the phone book. And i gave it a try. And yes it was the first owner that bought the car new in 1956. He told me some stories about the car, i will convey them later. But he told me that he traded the cabriolet in 1962 for a new VW with a sunroof not an upgrade exactly..
Petri steering wheel is missing the horn button, otherwise i guess its the best part of the interior. Indicators are worth the weight in gold as i understand it, and i have one (almost) :-) After this picture was taken i removed it and with some oil i got it working like new. The interior looks a bit better when the grass was removed. Some hot wrenching and oil and the top started to move again. 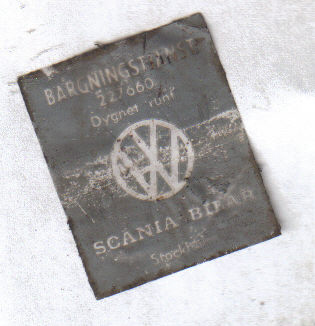 Found this label from Scania Bilar on the inside on the glove box, its from the company that sold the car back in 56. Copyright © 1997 Flatlanders, All rights reserved.